Foothab basics while thinking about the runners remaining in the woods at the Barkley Marathons. It's a winter wonderland today! But the snow is *really* wet so it's not great ski weather. 'Bent and Tarno ran at Pretty River so I caught a ride to Pretty River Road and planned to run back to the condo, mostly on the Bruce Trail. 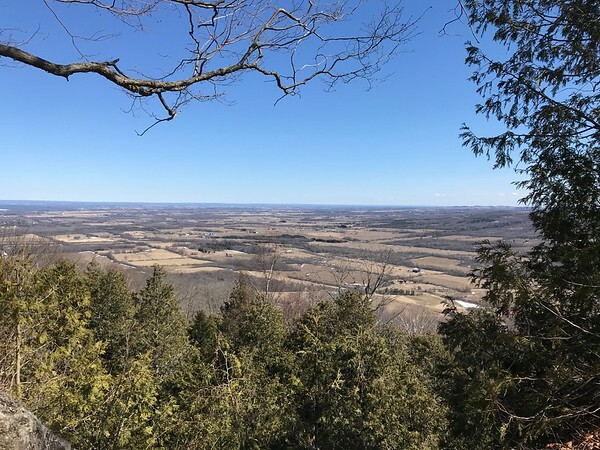 Jacquie accompanied me to the high point of the Bruce Trail, then she headed down to the car while I continued. The weather was crazy - wet snow falling with occasional ice pellets. 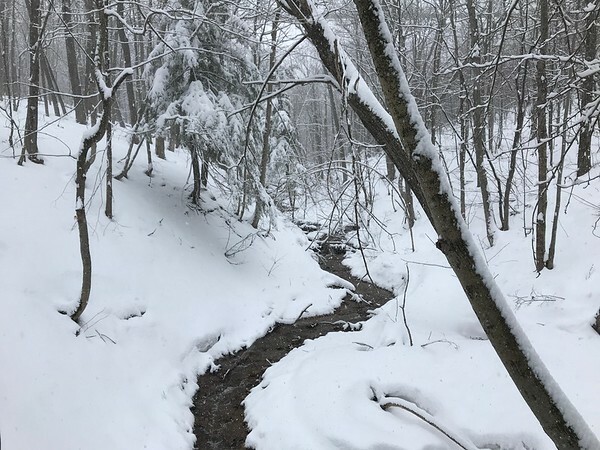 For most of my route, I was breaking trail in ankle deep (or much deeper), wet snow with some surprise postholing or near-sprained ankles when I broke through to rocks. Definitely not a day for speed! 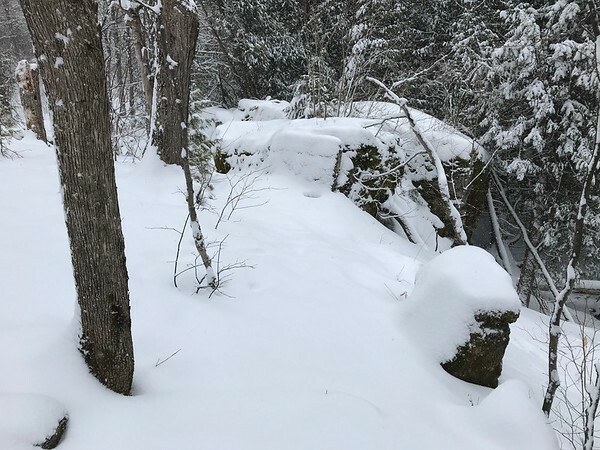 In several long sections, I had to guess where the trail went since it didn't look much different from the rest of the forest, and the white blazes were hidden by snow. The trail is ahead of me in this photo, for example. It was super fun though! Days like this make me so happy that I found adventure racing and orienteering. 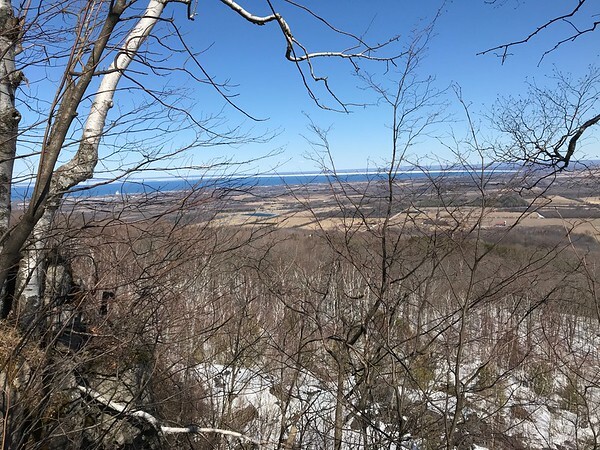 When I saw the Orchard Chair wasn't running at Blue Mountain, I thought I would try to follow mountain bike trails down but it wasn't as easy as I'd imagined. Really, I should have had snowshoes. Sometimes I bushwhacked since I didn't want to go onto ski runs or travel over big wooden mountain bike "features". 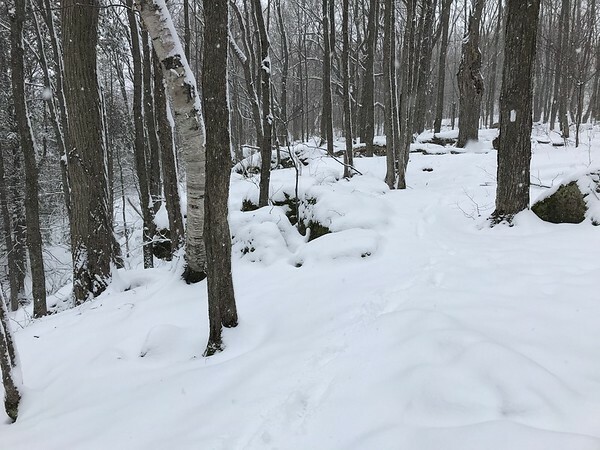 Given that I was alone in nasty weather in ankle turning conditions on untravelled trails, this part might have been a little too adventurous. I'd promised myself a Beaver Tail in Blue Mountain Village but first I stopped to watch the Red Bull "skiing into water" event - whatever it's called. After that, I was soaking wet and chilled so I bought my Beaver Tail before leaving for my 5-6K run home on the flats - and then 'Bent texted and offered to pick me up. He didn't have to ask twice. It had been a fun, tough run but the last part would just be road and rail trail - a "make work" project. 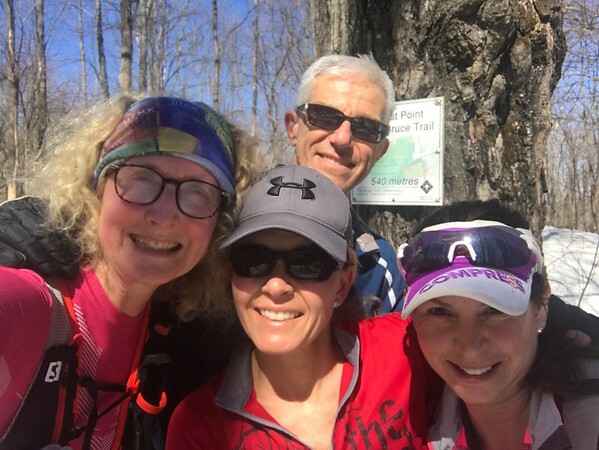 Mix of hiking and gentle running on a bluebird day at Pretty River with 'Bent, Dee and Mrs. Gally. Lots of climbing, lots of ice, lots of chatting - so nice! Quote from my arborist as we walked around the forest on our property to plan his work: "I'm really impressed at the way you charge bush!" Another day hanging out with Mom, who is doing much better after the big scare. She'll be in hospital for another week so I taught her some new Sudoku tricks. High hopes for today but taxes won out over running. Boo. Long day of driving out of town, hanging out with Mom in hospital, driving to her apartment to collect a few items, chatting with doctors, etc. She's doing much better but her unscheduled "vacation" will continue for awhile longer. I've just sent a request to drop to a lower distance at the Whiskey Basin Trail Runs. It was a dubious idea to try to run 88K mostly on ski and snowshoe training, although that strategy worked OK at Transgrancanaria. 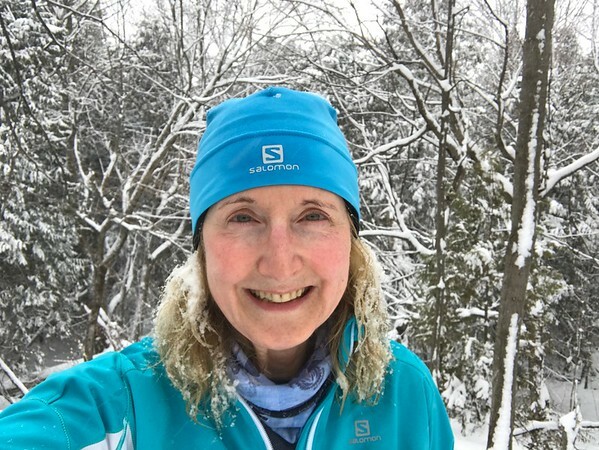 I really needed to translate my snow sports fitness to running in the final six weeks pre-race but between my cold and Mom's health, that hasn't happened and it's too late now. So look out, 'Bent - I'm going to be racing you in the 60K!